DESCRIPTION: A well-presented two bedroom property in the popular St James area of Tunbridge Wells. The property comprises a sitting room, kitchen/dining room and cloakroom on the ground floor and two bedrooms and shower room on the first floor. There is a lovely rear garden which partially overlooks the park behind. The location is walking distance to the town centre and the mainline stations. SITUATION: The St James's quarter of Tunbridge Wells is a fantastic place to live. Many of the streets are rarely used by people outside of the immediate area and remain quiet and peaceful. There is immediate access to the town centre along Camden road, it offers a wide range of highly regarded restaurants, bars and independent retailers. The Royal Victoria shopping precinct is some 10 minutes distance with its wider range of multiple retailers. The property sits between the towns two mainline railway stations. Beyond this, Tunbridge Wells has an excellent mix of educational facilities at primary, secondary, independent and grammar levels. Many of these are readily accessible from the house. ENTRANCE: Via entrance porch with double glazed entrance door. Double glazed window to front, laminate flooring. SITTING ROOM: Double glazed window to front, built in cupboard, laminate flooring, radiator, stairs to first floor. KITCHEN/DINING ROOM: A good sized room with a range of wall and base units with complimentary worktop, inset sink and drainer with mixer tap, spaces for washing machine and free standing cooker, extractor hood, part tiling to walls, laminate flooring, glazed door to rear, concealed wall mounted gas central heating boiler, double glazed window to rear. CLOAKROOM: Double glazed window to side, low level WC, pedestal wash hand basin, tiled splashback. FIRST FLOOR: Landing with loft access with fitted ladder. 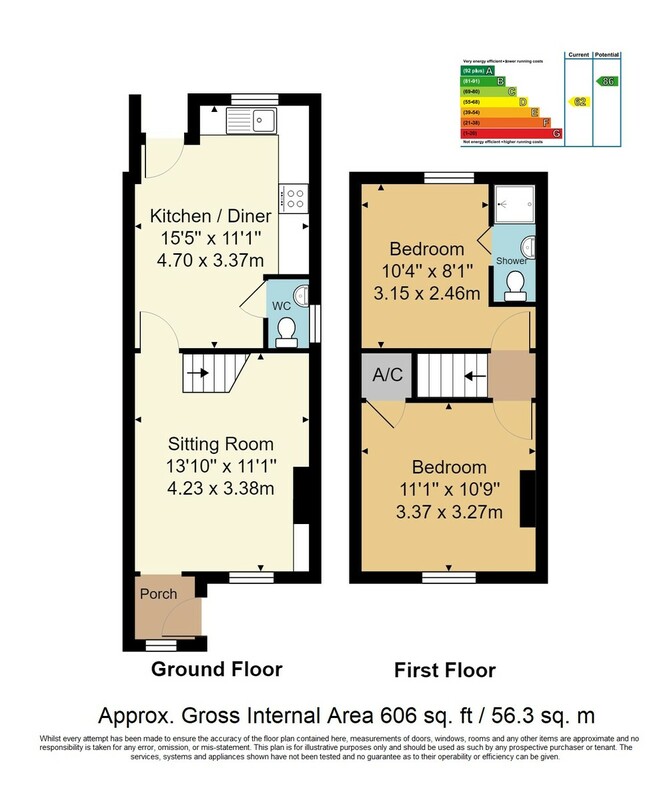 BEDROOM: A double bedroom with double glazed window to front, built in wardrobe, built in airing cupboard housing pre-lagged hot water tank with shelving above, carpet, radiator. BEDROOM: A single bedroom with double glazed window to rear, carpet, radiator. SHOWER ROOM: Shower cubicle, wall mounted wash hand basin, low level WC, tiling to walls, laminate flooring. REAR GARDEN: A lovely rear garden with wall to rear and fencing to boundaries, wooden shed, planting to borders and patio area. Shared right of access to side and rear. PARKING: On street parking to the front of the property.